One of the biggest clichés of big-budget action movies is a character running from an explosion in slow motion (which is absurd, because outrunning an explosion is impossible). Independence Day wasn’t immune to the convention, but it added a nice twist, as a dog named Boomer narrowly escaped such certain death in a tunnel. Despite the chaos dished out on humans in the movie, audiences cheered at the outcome of Boomer’s cliffhanger scene (as if there was any doubt he wouldn’t survive). A fable about friendship and loyalty in Hollywood at the close of the silent-movie era, The Artist probably wouldn’t have been the same film if not for a Jack Russell Terrier named Uggie. Presented without a dialogue track, emotions are conveyed with gestures, subtleties, and expressions, and Uggie does a superb job of supplementing what his owner goes through during the film. Uggie also proves the mantra of man’s best friend: His owner’s ups and downs don’t matter to the pooch, as he remains loyal to his owner, and even saves his life at one point during the film. One thinks of Pixar’s Oscar-winning movie Up, and the first thing that comes to mind is the dogs (if not, then the heartbreaking montage opener). 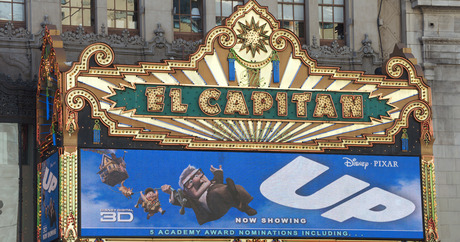 Several computer-animated movies featured man’s best friend, but Up went above and beyond (pun intended) by allowing audiences to hear what they were actually — squirrel! — thinking via dog collars that gave a voice to their thoughts. The movie’s narrative was engaging enough; but once a Golden Retriever named Dug enters, he steals his every scene. No actor upstages Clint Eastwood when he plays Dirty Harry — no one upstages Eastwood when he plays anybody. But in Sudden Impact, his fourth film as the notorious San Francisco detective, Clint met his match. Given to Harry as a “gift” from a friend, Meathead, a Bulldog, slobbered, farted, and peed his way into his reluctant owner’s heart. Don’t think Harry cares about the dog? When the pooch is roughed-up (offscreen) by some goons late in the film, Harry’s face takes on a frightening scowl — supplemented by a facial tic — as he breaks out the heavy artillery to deliver some heavy-duty payback.